Alex Merino takes 1st at Nov 2014 Gathering in Oxford MS! Merino (R) takes 1st at March 2014 Music City Open in Nashville! Merino (L) takes 1st at March 2013 St. George’s Open at SGS! 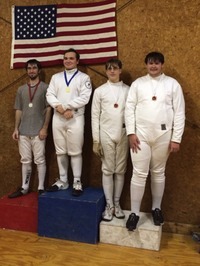 The St. George's High School Fencing Team was started in 2010 by SGS student Jake Doan (the Team's first Captain and now at Indiana U) and Coach Tom Knowles. 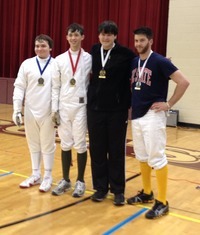 In 2012 at the TN Secondary School Fencing Championships, SGS Gryphons finished 3rd in Team Epee and then-Capt Jake Doan tied for 3rd in Individual Epee. Capt Alex Merino is carrying on the torch of SGS Fencer achievements by placing first at several local and regional competitions. His accomplishments are now becoming very numerous! 2014 Nov - Merino takes first at Oxford MS tournament called The Gathering! 2014 Nov - Merino takes first at National Junior Olympic Qualifiers for TN! 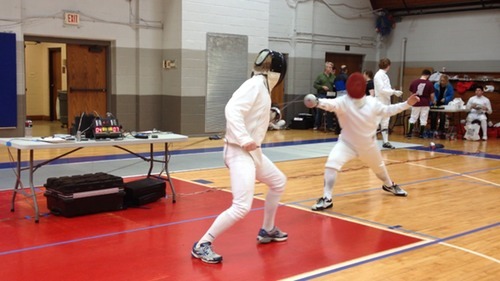 Alex Merino (R) wearing his signature red mask: in action vs an MUS fencer. He is winning 7 - 4 in a DE (direct elimination) bout. 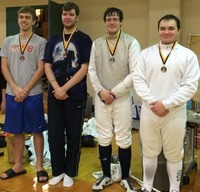 The bout - which he won - is over when one of the fencers reaches 15 points.